Summary: A small girl commented afterwards that it was better than The Lady Vanishes. High praise indeed. 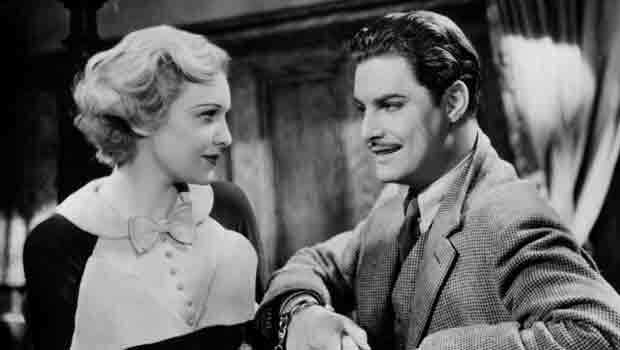 The BFI are celebrating the life and work of Robert Donat. ‘Who?’ I hear you ask. Well, before Mr Donat was Mr Chips, he was the debonair hero of Alfred Hitchcock’s classic, The 39 Steps, and if you haven’t seen it, do. Richard Hannay is a Canadian, spending some time in London. Despite being a colonial, he’s about as true blue as you can imagine, with a nice Old Etonian accent and an attractively floppy hair do. As you do when on holiday, Hannay visits the theatre, where a variety act is in progress – Mr Memory – whose amazing powers of recall are tested by the audience. Some of the crowd have been at the gin; a scuffle breaks out and gunshots are fired; in the kerfuffle, Hannay finds himself leaving the theatre with a woman, who asks if she can come home with him. She introduces herself as Annabella Smith (Mannheim), a secret agent, working to prevent secret information leaving the country. At Hannay’s flat, she points out the men waiting on the street below and begs him not to answer the phone; he offers her his bed, and bunks down on the sofa only to be awoken a few hours later by her staggering in, a bread knife sticking out of her back. Hannay knows that he is being set up, so makes a rapid getaway, heading for Scotland following the clues ‘Miss Smith’ has left him. The train journey to Edinburgh passes peacefully enough but by then the story has caught up with him and he is forced to leave the train. After a series of comical but unnerving episodes, he meets Professor Jordan (Tearle), who he thinks will help him, only to realise that he is in fact the leader of the foreign spies known as the 39 Steps. Hannay is arrested, and Pamela (Carroll) brought along to identify him, but the detectives are actually members of Jordans’s gang. Hannay and Pamela escape, spending a very funny night handcuffed together at a highland inn before ending their adventure in London and in love. Hitchcock’s early successes, The 39 Steps and The Lady Vanishes, are among the finest films he made, mingling comedy and thrills to great effect. Many of the same elements that are seen in The Lady Vanishes are present here in an earlier form – the travelling salesmen who transform into the cricket-loving Brits in the later film. And the same patriotic fervour infects this film. Hannay exists in a world where evil agents of an unnamed foreign power are attempting to steal British secrets – the only difference between his world and ours is that we wouldn’t believe that we had the technological advantage. He does seem remarkably blasé about the whole adventure, rising to every occasion with aplomb. Hitchcock cast Carroll, whose character did not exist in the original novel, as one of his prototype blondes. She is coolly disbelieving, but once she sees he is telling the truth she is wholly on his side. Their courtship is witty and sparkling and very very funny. The audience I saw the film with was very mixed; a small girl commented afterwards that it was better than The Lady Vanishes. High praise indeed.